Have preschoolers make a “herd” of these reindeer and decorate a whole tree! 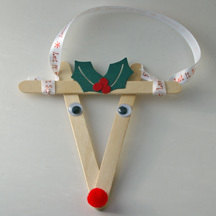 What You Need: 3 Popsicle sticks (craft sticks); 2 googly eyes; red pom pom; hole punch and holly-shaped punch (or make a template and cut them out); red and green cardstock; ribbon; glue. How to Make It: Arrange 2 craft sticks in a V shape. Overlap third craft stick about 3/4 inches from top of V. Use glue to attach eyes and pom pom nose. Punch out and glue on 2 holly leaves and 3 berries (or whatever you’d like). Tie length of ribbon to both sides to hang ornament. This entry was posted on Monday, December 17th, 2007 at 10:05 am	and is filed under Christmas crafts, Popsicle stick crafts. You can follow any responses to this entry through the RSS 2.0 feed. Responses are currently closed, but you can trackback from your own site.